Built as a Brake Corridor Second by BR at the ex-LNWR’s Wolverton Works in 1963, No. 35466 was purchased by the VSOE Company in 1994. The vehicle was intended as a replacement for Baggage Car No. 7, an ex-LNER racing pigeon carrier of 1943 origin, which had been in VSOE service since the official launch of the train in November 1981. New safety regulations deemed that this vehicle could no longer run in the VSOE formation, despite the fact that it had earlier been plated in metal for main line running. No. 35466 was outshopped from Stewarts Lane in 1995 in the guise of ‘’Baggage Car No. 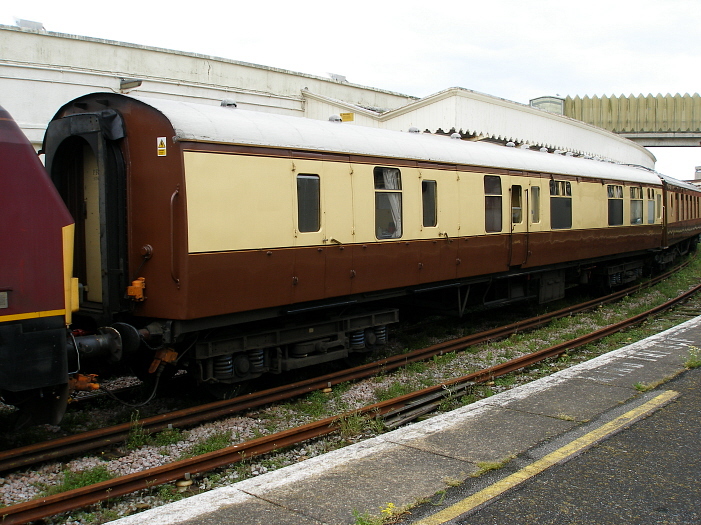 11’’, wearing the Pullman ‘’New Standard’’ livery of Umber and Crème. It was joined in the same year by two further baggage vehicles: Continental Ferry Scenery Van No. 889202, built at Eastleigh in 1955, and BR Mk 1 Brake Corridor Second, built in Birmingham in 1956 by Metropolitan Cammell. These became Baggage Car Nos. 8 and 9 respectively, being allocated to Stewarts Lane. No. 8 was latterly based at Crewe, becoming a baggage vehicle for the VSOE Company’s ‘’Northern Belle’’ service. Interestingly, Baggage Cars have been numbered in the series 7, 8, 9, and 11 – there has never been a No.10.